UC San Diego has many programs to help you stay informed and active. Students are invited to take part in nearly 50 multicultural associations and social justice collectives. Similarly, faculty and staff can play an integral role in removing barriers and challenging discrimination by becoming involved in academic outreach and awareness programs, affirmative action committees, and the many staff associations offered on campus. 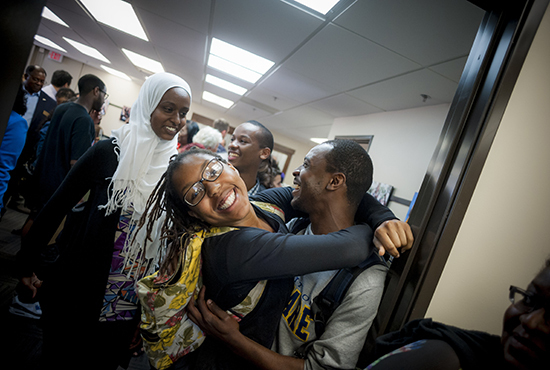 The centers are a place of belonging where all students, staff and faculty can find community, explore social justice issues, gain leadership skills, engage in open dialogue and take part in educational and social activities. Do you have an amazing idea that will help transform educational access? Are you hosting a cultural celebration on campus? The Office for Equity, Diversity, and Inclusion partners with several campus departments to provide grants and co-sponsorships for your innovative programs. Equity, diversity, and inclusion are critical to our mission of excellence at UC San Diego. Our goal is to continue to build a diverse, equitable and inclusive university that enriches the educational experience, strengthens community, promotes critical thinking, and gives the university an intellectual and competitive advantage. Last fall, Governor Brown signed into law the Gender Recognition Act (California Senate Bill 179). The law streamlines the process for Californians to apply to change their gender markers and creates a nonbinary gender category (the letter “x” or “nb”) on California birth certificates, drivers’ licenses, identity cards, and gender-change court orders. This enables many in our community—including transgender, intersex, and nonbinary people—to have full recognition in California. To prepare our campus for this transition, Vice Chancellor Petitt has asked Cindy Palmer, Assistant Vice Chancellor for Academic Personnel; Nancy Resnick, the incoming Chief Human Resources Officer; and Shaun Travers, Campus Diversity Officer and Director of the Lesbian Gay Bisexual Transgender Resource Center, to co-lead a steering committee to advise senior leadership on measures to prepare for this change. Get more information and answers to frequently asked questions (PDF).